Good bosses are appreciative, communicative individuals who make their staff feel valued and help them do their jobs better. Difficult ones do none of the above and their bad behaviour is a key reason why people quit their jobs or put in for a transfer. Bad-boss shortcomings can range from being control freaks and taking all the credit to showing disregard for people’s time and effort. Also on the list are the career climbers who are so busy playing office politics that they scarcely manage at all. And at the really serious end of the scale are bosses that bully or intimidate employees. Most employees could answer that pretty quickly. Louise’s boss is never there and is very slow to answer emails, voicemails or texts. She used to seethe with frustration waiting for the green light. Now she sends her boss an email stating what she plans to do and gets on with it if he doesn’t respond. She is also using his absence as a golden opportunity to showcase her abilities to his peers and above and to build relationships with other departments with a view to moving job. Peter overcame his nightmare boss by redefining how he saw her. “She micromanages and she’s still not happy with the results,” he says. “She never gives or asks for feedback and when there’s praise going she’s in the front row. When something goes wrong she points the finger and walks away. “I coped by changing how I thought of her. Instead of seeing her as my boss I pretended she was a stroppy customer I had to ‘get around’. I also found someone in my organisation willing to mentor me. He was more experienced and we’d discuss a problem and how to deal with it.” By networking upwards, Peter killed two birds with the one stone. He got help to manage his manager and his mentor saw that Peter was a bright and committed employee. With his help Peter got promoted. 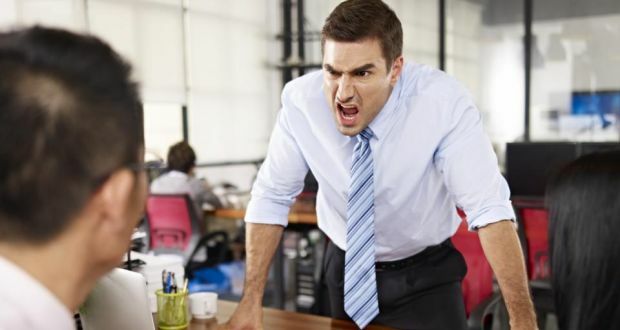 Working for a bad boss can be hugely demoralising, so it’s important to remain pro-active and highly visible to those who could change your situation. Make sure your name goes on reports and projects. Volunteer to arrange or facilitate meetings. Don’t miss opportunities outside your normal area such as working on a project with people from other departments. A classic bad-boss trick is to dump a huge assignment with an impossible deadline. You may feel like screaming. Instead take control of the situation. Arrange a meeting at which you map out the project’s stages. Then list the time and resources required for each to show how unrealistic the deadline is. Ask what could be dropped or if others could be drafted in to help. Move on if you’re really stressed. Set a timeframe and do what you need to do to smarten your skills set. Develop good relationships with the people around you to diffuse some of the frustration. Work out what makes your boss tick. Life will be easier if they see you as a supporter with shared values. Bosses who bully should be reported and your verbal complaint should be followed up with a written report containing all the detail you can remember. Bullies often back down if confronted, but be sure of yourself before taking one on. Resist the urge to make your boss look bad. If he or she is really that inept they will trip themselves up sooner or later. If your boss has a big ego, present your ideas in a way that will reflect well on him/her. This keeps them on side while allowing you to execute your idea. Tired of only being communicated with electronically? Try turning up in person to answer an email. Your boss may not like it, but the natural rules of face-to-face communication will come into play. Stay positive. Working with a difficult boss can help you learn what not to do and how to develop excellent coping skills.